This has been Russ' deluxe shower accommodations for the last 2 months. 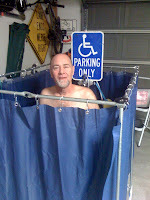 Since the catheter is out and he's showering in the real shower upstairs inside the house, we thought we'd (I of course) would have a little fun with it. YES, Russ is finally hardware free, no casts, no hoses, no wheelchair. It's like when you have a baby and they turn into toddlers and you feel like you have so much more freedom. To go somewhere we just have to load Russ (granted he loads a little slower then a toddler) the walker, and a soft cushion into the car and off we go. We are limited to short trips, but o' boy it feels good to go. He's been working hard or should I say the therapists are working him hard. He's walking more upright and feeling stronger. He's probably been more sore recently, but that's because he's pushing harder to build endurance and flexibility. His next big move will probably be driving, that won't be for a couple of months so the roads are safe for now. I'll try to post at least once a week with whatever updates we have, thanks for caring.